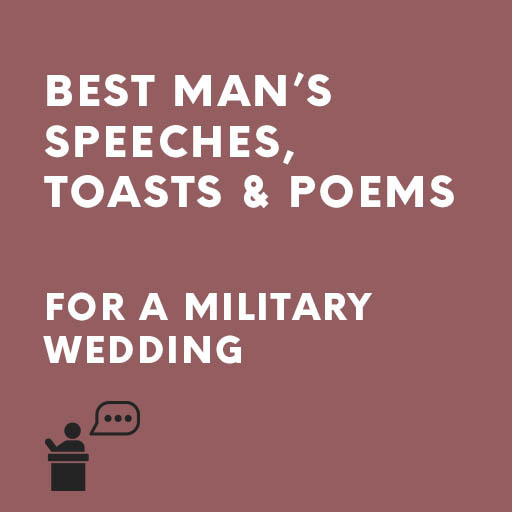 These best man speeches from a comrade are light-hearted yet sincere and are suitable for use at a military wedding. They include a response to the groom’s toast to the bridesmaids and end with optional toasts to the couple (The father of the bride may prefer to give this toast). The poems add an unusual finishing touch to the speeches. This pack also includes a useful best man’s plan, a real must-have for you on such an important occasion. This gives ideal guidance to you if you are not 100% sure of your duties, explains wedding etiquette and also gives lots of thoughtful suggestions to help you to ensure the day goes off smoothly. They are tried, tested and ready to use. They may be downloaded instantly when you place your order. Order our Ready-to-Go Best man’s speeches, toasts & poems + M.C. Guide for army/military wedding. These best man speeches from a comrade are light-hearted yet sincere and are suitable for use at a military wedding. They include a response to the groom’s toast to the bridesmaids and end with optional toasts to the couple (The father of the bride may prefer to give this toast). The poems add an unusual finishing touch to the speeches. This pack also includes a useful best man’s plan, a real must-have for you on such an important occasion. This gives ideal guidance to you if you are not 100% sure of your duties, explains wedding etiquette and also gives lots of thoughtful suggestions to help you to ensure the day goes off smoothly. They are tried, tested and ready to use. They may be downloaded instantly when you place your order.